The nasopharynx is located behind the nasal cavities and above the soft palate. Basilar part of the occipital bone. Soft palate (sloping upper surface). Pharyngeal isthmus, an opening in the floor between the free edges of soft palate and posterior pharyngeal wall. Anterior wall: It’s created by posterior nasal apertures divided by the posterior edge of nasal septum. Posterior wall: It creates constant sloping surface with roof. It’s supported by anterior arch of C1 vertebra. Lateral wall: Medial pterygoid plate of sphenoid. Nasopharyngeal (pharyngeal) tonsil: It’s a collection of lymphoid tissue underneath the mucous membrane in the junction of the roof and posterior wall of the nasopharynx. From its apex a mucous diverticulum named nasopharyngeal bursa (pouch of Luschka) goes upwards in the substance of nasopharyngeal tonsil. This bursa grows because of adhesion of notochord to the dorsal wall of the pharyngeal part of the foregut. It is supplied with mucous glands. Occasionally above the pharyngeal tonsil a small dimple is observed in the mucous membrane. A craniopharyngioma may originate from it. It signifies the remains of Rathke’s pouch. Orifice of the pharyngotympanic tube or auditory tube (eustachian tube): This is located on the lateral wall in the level of the inferior nasal concha and 1.25 cm behind it. Salpingopharyngeal fold goes vertically downwards and fades on the side wall of the pharynx. It includes salpingopharyngeus muscle. Salpingopalatine fold goes downwards and forwards to the soft palate. It includes the levator palati muscle. Pharyngeal recess: It’s a deep depression behind the tubal elevation; it’s referred to as pharyngeal recess (fossa of Rosenmuller). 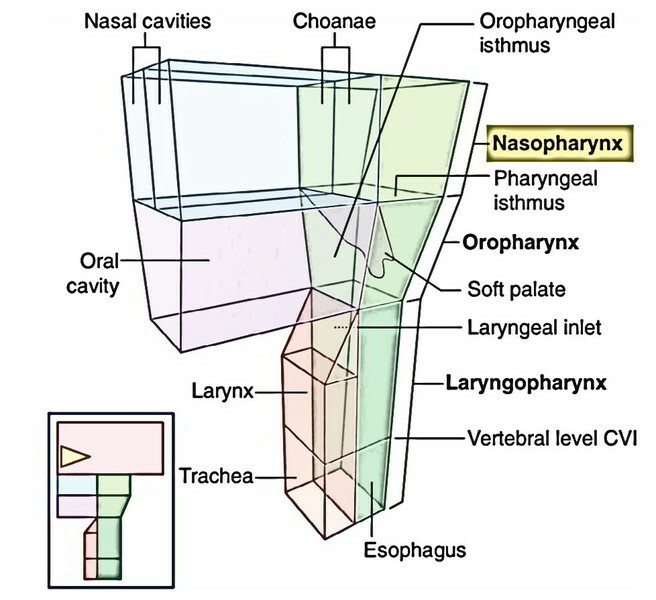 Structurally and functionally the nasopharynx resembles the nose. It’s respiratory in function and lined by pseudostratified ciliated columnar epithelium. Its walls are stiff and non-collapsible to maintain the air passage patent. Some fibres of the palatopharyngeus muscle (originating from palatine aponeurosis) cross horizontally backwards and join the upper fibres of the superior constrictor muscle to create a U-shaped muscle-loop in the posterior pharyngeal wall underneath the mucosa, which is pulled forwards during consuming to create the Passavant ridge. During consuming the pharyngeal isthmus (the opening between the free edges of soft palate and posterior wall) is closed by the elevation of the soft palate and pulling forwards of posterior pharyngeal wall (Passavant ridge). This U shaped muscle loop so functions as a palatopharyngeal sphincter. Adenoids: The nasopharyngeal tonsils are notable in children up to the 6 years old, then slowly go through atrophy till puberty and just about totally disappear by the age of 20. The nasopharyngeal tonsils when enlarge as a result of infection are called adenoids, which obstruct the posterior nares making ‘mouth breathing obligatory’. Toneless voice (because of absence of nasal tone). The infection from pharynx can easily enter middle ear via pharyngotympanic tube.